Rosso Woman is a perfume by Benetton for women and was released in 2010. The scent is fruity-sweet. The production was apparently discontinued. Contrary to other reviewers, I do not think that ROSSO is a clone of HYPNOSE. I'd say that it would be better described as "HYPNOSE meets HYPNOTIC POISON"--specifically the Playdoh facet of the latter. Fortunately, there is no rootbeer here, so I actually prefer this composition to HP. ROSSO is much lighter, too, so more appropriate for summertime. It just dawned on me why perfumers would include a Playdoh note in their creations: this is a comfort scent! Return to your childhood, sit on the floor with your legs crossed and create sculptures from extruded Playdoh. 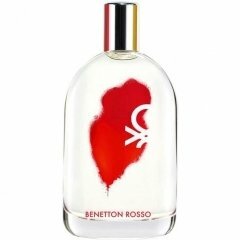 On my skin ROSSO edt has both low sillage and poor longevity. But it smells pretty good while it lasts. This is not a typical fruity floral--more of a light oriental, it seems to me. Not bad at all, and I think that ROSSO would make a fine gift for a teenager. Write the first Review for Rosso Woman!